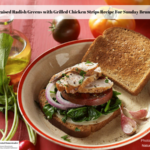 Thanks to Nature’s Own Life Bread for allowing me to share this delicious recipe! Cut radish roots from greens and reserve radish roots for another use. Wash radish greens in cold water several times to remove all dirt and grit; dry in salad spinner or with paper towels. In medium skillet, heat oil over medium heat. Cook and stir radish greens and garlic 2 minutes or until tender and water has evaporated. Season with salt and pepper. For each sandwich, place one slice of cheese on one slice of toast. Top cheese with half the radish greens, a tomato slice, an onion slice and half the chicken. Top with another slice of toasted bread.